More than 1,000 sixth form pupils and 60 teachers from schools across Northern Ireland have visited the University of Ulster at Coleraine to take part in an annual revision conference hosted by the School of English. 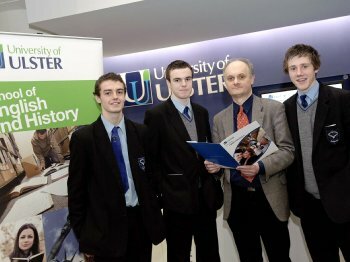 The day provided an opportunity for students taking English at A-level to develop their critical understanding of a number of key texts in the literary tradition of the English language, and to get a taste of what studying English at the University of Ulster is like. With 25 lectures on authors ranging from Shakespeare to Toni Morrison, and from John Donne to Carol Ann Duffy, there was a chance for pupils to learn more about the texts they are studying and to meet academics who are specialists in the various areas of English literature covered during the event. Professor Jan Jedrzejewski, head of the university’s School of English, said: “We are delighted to have been able to bring so many English students and teachers to the Coleraine campus. “It is essential for a university which is serious about its role in the region to maintain close links with schools across the province. We want to work with teachers to enhance the learning opportunities available to secondary students across Northern Ireland and this conference is an important element of that process. “The School of English engages with schools on other projects as well: the Ulster Poetry Project, co-ordinated by Dr Frank Ferguson, will help pupils across Northern Ireland learn about the literary heritage of the province, and indeed develop their own creative interests. Added University of Ulster English lecturer, Dr Timothy Hancock: “It’s always good to meet the pupils and teachers who come along to this conference. They bring with them an infectious enthusiasm and attentiveness that makes for an enjoyable learning experience all round. *For further information contact: Audrey Watson (a.watson1@ulster.ac.uk). Tel: 028 90366386.